If all lives matter than every person killed by police would independently be investigated. An objective court, prosecutor, district attorney and lawyer would ensure that justice was not always labeled “Justified”. When it’s your loved one it matters, when it’s their loved one your loved one does not. It’s that simple. There are two classes in America, those who are “forced to obey the law” and those who are “above the law”. Being above the law means you have a title such a police, judge or other public servant. Or you have money to buy justice. If you don’t have money or a title you’ll lose everything, be labeled guilty till proven innocent and spend time in jail. Matters not if your innocent, honest, hard working or doing the right thing. What’s worse is you could end up dead and the word of your killer will be believed over the truth, even video or audio evidence. Your killer will not be subjected to what other criminals must endure. Polygraph testing, long and harsh interviews pressing for a confession, time in a cold cement walled jail cell away from family, loss of your job, treated as guilty and huge legal bills. 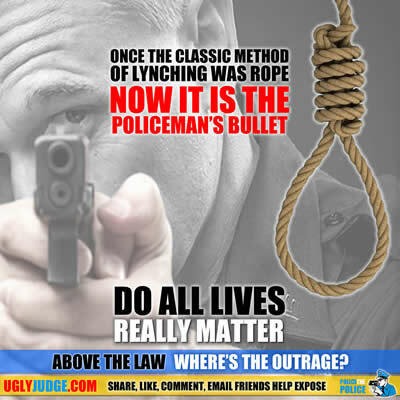 Fact is there really is no “Justice for all in America” and “All lives matter” is a lie. Obama’s Task Force on Policing: Will It Be Different This Time?